WASHINGTON — There may not be a more fitting duel for the Trump era than the one between a president who spends a lot of his time watching cable television, and a powerful member of Congress who's often on it. When House Intelligence Committee Chairman Adam Schiff, D-Calif., announced an ambitious expansion of Democratic-led probes into President Donald Trump and his administration this week, the nation got a preview of a battle that will be central to nearly everything that happens in the nation's capital for the next two years. And the sparring could be as fierce behind the scenes over the airwaves and social media. For the first two years of the Trump presidency, Schiff was by his own admission "just trying to tread water" as a minority member of the House. Now, he's emerged as perhaps the president's fiercest adversary in a House newly empowered, and in fact eager, to investigate all aspects his political and personal life. Trump has mocked the Senate's top Democrat, and sparred with the new House Speaker. But this week featured some of his most cutting remarks to date — aimed at Schiff. On Wednesday, after Schiff announced his committee would expand its probe into Trump and potential foreign influence, the president dismissed him as a "political hack." "It's called presidential harassment and it's unfortunate and it really does hurt our country," he said. Thursday he escalated the fight by accusing him of "stealing people who work at White House." And Friday he tweeted or retweeted multiple messages about the fact that Schiff attended the same conference on national security as a key figure behind the so-called Steele dossier. "It is all a GIANT AND ILLEGAL HOAX," Trump said in one tweet. "I can understand why the idea of oversight terrifies him," he said. "We need to do our job, he needs to do his. And a big part of our job is making sure we root out any corruption or malfeasance." The president's focus on Schiff may be as much about the new tools he has in the majority to probe him, his business and his White House as it is about his frequent appearances on television. And the two adversaries could not be more different. Trump is unscripted and seems to revel in the chaos around him. Schiff's public comments and even his occasional tweets carry his lawyerly, measured tone. "Adam is as cool as a cucumber. And the president is hot as a jalapeño pepper," Rep. Jackie Speier, a fellow California Democrat and Intelligence Committee member, told NBC. The 58-year-old Schiff first came to Washington in 2001 after serving as an assistant U.S. attorney and state senator in California. He considered but ultimately passed on a run for the U.S. Senate in 2016 after the retirement of Barbara Boxer, deferring to another prosecutor, Kamala Harris. Dianne Feinstein's decision to seek a fifth full term last year again cut off a path for higher office. 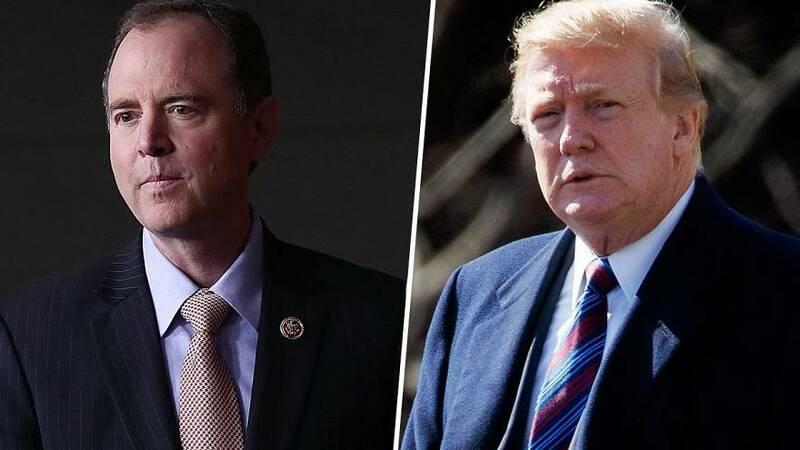 But the position Schiff has had as the top Democrat on the Intelligence Committee, especially now as its chairman, has given him a significant platform all his own. He was one of the party's most prolific fundraisers ahead of the 2018 midterms, traveling throughout the country to support local candidates. He even raised eyebrows with a trip to the early presidential voting state of New Hampshire just last week, his second visit in less than a year. He assured voters there that he was not among the dozen, or dozens, likely to run. But he said he would be watching closely to see "who can rise to the occasion, who has the stature and the gravitas and experience to take on this president." Schiff's critics have seized on his expanding profile to argue he is using a fishing expedition to boost his public profile. "This is clearly an investigation, again, without a crime. We looked for two years and didn't find anything at all," Rep. Devin Nunes, R-Calif., the top Republican on the Intelligence Committee, said on Fox News Channel this week. "You can't go home and tell the voters back home that you're going to work for the president and then come to Washington and do nothing but investigate the president," he said on "Fox News Sunday." Schiff pushed back on the insistence by Republicans that no investigations have yet revealed collusion between Trump allies and the Kremlin. Appearing on NBC's "Meet The Press" Sunday, he noted secret talks between former national security adviser Michael Flynn and the Russian ambassador, the June 2016 Trump Tower meeting, and efforts by Trump associates to pursue a real estate deal in Moscow as examples of "corrupt coordination" or "corrupt combination" that needed to be further explored. It's ultimately up to Robert Mueller to determine if there is a crime, he told Chuck Todd. But Democrats have a separate obligation "to make sure that the president of the United States is working in the national interest, that he is not motivated by some pecuniary interest, or fear of compromise or actual compromise."